Le Chateaubriand had been on my mental itinerary for Paris for quite some time. It had been ranked as high as 9th in the world in 2011 (currently 15th), and although I recognize the shortcomings of such "world's best" lists, I figured such a restaurant couldn't have become so highly-regarded without merit. And who wouldn't welcome the opportunity to dine at a "world's best" restaurant? I decided on Le Chateaubriand, as opposed to the many other celebrated restaurants in Paris, for a couple of reasons. First, they take reservations, and there is also first-come, first-serve seating available in the late evening should a reservation not be available. It thus seemed like a safe bet that we would end up with a table one way or another. Second, from what I could tell based on my online research, it is far more affordable than many other star restaurants in town. Someday, when I win the Mega Millions, I'd love to check out the likes of Michelin-starred L'Arpege and Guy Savoy, but for now, Le Chateaubriand seemed to be a more accessible option to us Average Joes (more on this point later). Rumor (here and here) has it that Le Chateaubriand only takes reservations two weeks in advance (or 15 days, depending on the source), and only during the hours of 3-7 pm, so I called at exactly 3 pm Paris time two weeks before my intended visit and prayed that the person answering the phone spoke English. He did. Reservation secured! I should mention a few cautionary notes should anyone reading this be interested in paying a visit: First, beware that there are two restaurants by the same name in Paris! 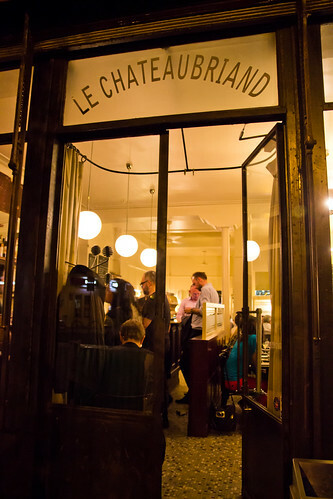 There is a Le Chateaubriand in the 17th arrondissement that even has a website - this may well be a lovely restaurant but it is not the more famous one on Avenue Parmentier in the 11th arrondissement. 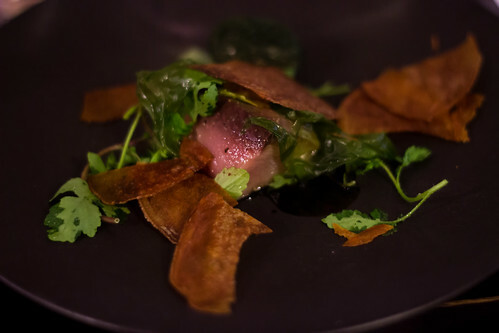 Secondly, Le Chateaubriand offers only a chef's tasting menu; the cuisine is modern and innovative, with a wide variety of ingredients that will almost definitely include meat, offal, and raw fish. As such, Le Chateaubriand is not for vegetarians, picky eaters, those with various dietary restrictions, or those squeamish about uncooked foods. On the other hand, if you are the kind of diner who's up for an adventure, you will get it here. First, the atmosphere: It is low-key, unpretentious, and has an old-world French bistro feel - a stark contrast from the nontraditional fare simultaneously being created in the kitchen. The restaurant gives off the impression of a local neighborhood joint rather than an internationally-recognized eatery. I wasn't sure about appropriate attire, so I donned the best clothes I had packed on the trip: a decent-looking flare top, slightly frayed jeans, and rubber Teva sandals. In other words, fairly casual. Luckily, there appeared to be no apparent dress code, as there were diners dressed to the nines, but also many who were dressed as informally as I did. Nobody seemed to care. We arrived about five minutes past our 7:30 pm reservation time; I had forgotten that the 7 o'clock hour is rush hour in Paris so did not plan ahead for extra travel time. Still, we were one of the first patrons to arrive and were promptly seated at a table near the back where it was fairly dark (a bit unfortunate for photo-snapping purposes). 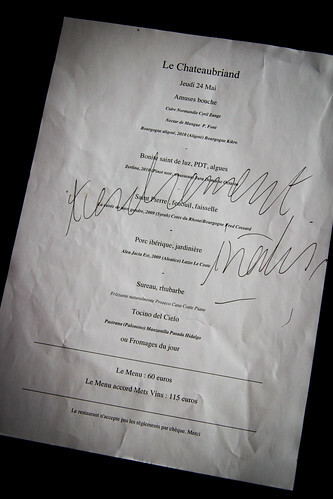 Prices at Le Chateaubriand appeared to have gone up since as recently as early May, but at 60 euros per person for the tasting menu at a "world's best" restaurant (as opposed to several hundred), I think it is a major steal. There was also the option of a wine pairing for 115 euros (total, not in addition to the 60), which I might have been interested in if we had not already ordered a bottle of wine by the time I saw the wine pairing option on the dinner menu. As for the meal, it consisted of several amuse-bouche courses, then three "main" courses, if you could call them that, and a choice of either cheese or desserts. Pretty much every course was unique, interesting, and phenomenal in some way, with combinations that one would not ordinarily expect. The waiters were nice to explain what was in each course, though it was sometimes difficult to hear or understand everything, so there was a little guesswork involved on our part as well. 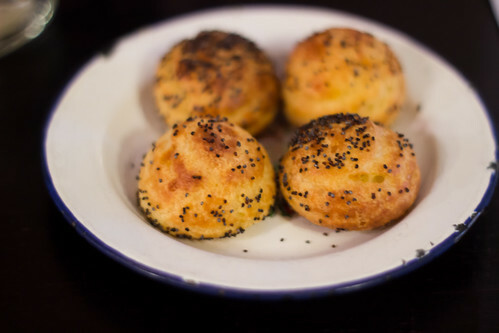 First came a shareable plate of soft and delicious Gougeres, or little pastry bites made with cheese in the dough and topped with poppy seeds. Then, some Ceviche Juice with Avocado that was very cleansing. 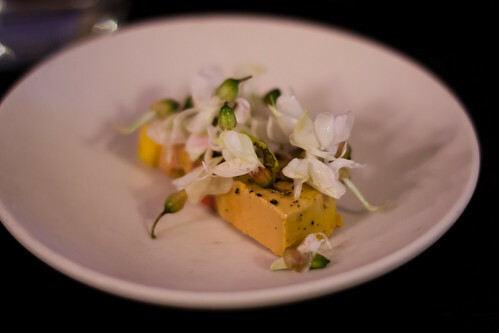 And then, buttery Foie Gras topped with flowers and served with bread - my favorite course of the evening! 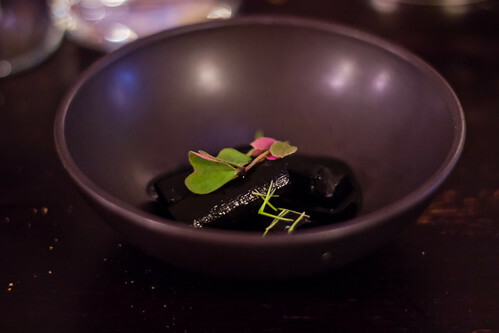 This was followed by Squid Ink and Asparagus, which was a really unexpected and interesting combination. 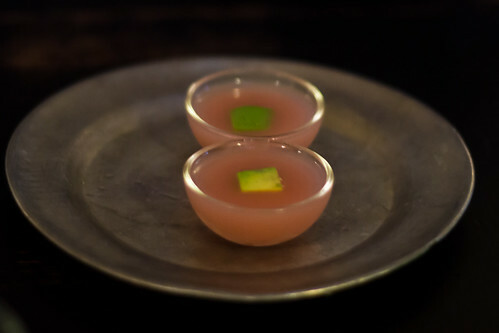 The final amuse-bouche was a Monk Fish Soup with thinly-sliced radishes. Then came the course identified on the menu as "Bonite saint de luz, PDT, algues." I have no idea what "PDT" is, but I do know that the fish is tuna, and it came with seaweed and potato crisps. It was a lovely mixture of soft and crunchy textures. 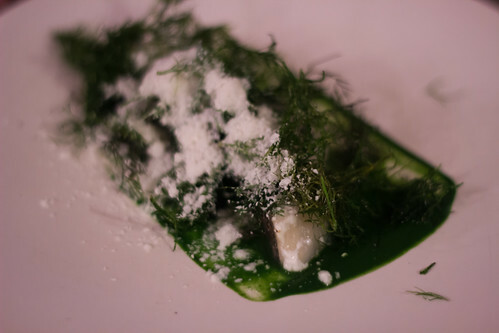 The next course was R.'s favorite: "Saint Pierre, fenouil, faisselle," or basically a white fish topped with fennel and fresh cheese, served in an herb sauce. 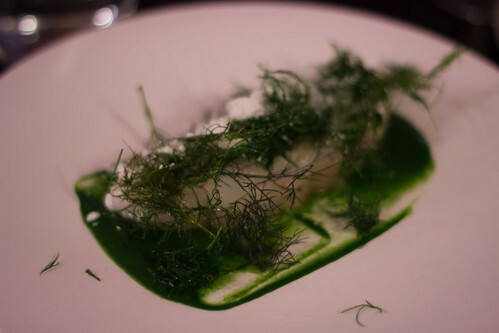 I am personally a bit weary of fennel as it can get too licorice-like for me, but this fennel was not too overwhelming and paired well with the fish. The fennel also seemed to have been roasted which gave it a really interesting, crispy texture. 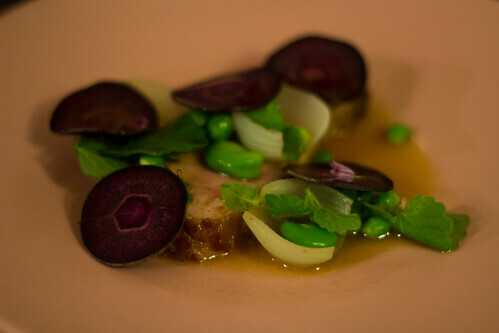 The last main course was "Porc ibérique, jardinière," or pork served with a mix of vegetables, including peas, Lima beans, onions, and sliced purple carrots. 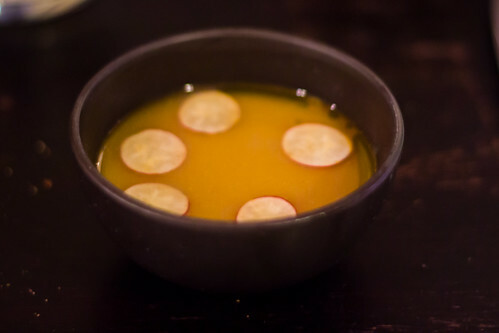 The accompaniment of a lightly salted broth reminded me of Chinese cuisine. Then we had a choice of cheese or dessert; we both went for the dessert. 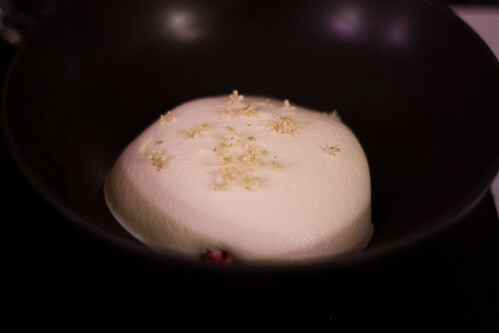 First came what was identified on the menu as "Sureau, rhubarbe," and explained to us by the waiter as marshmallows with rhubarb and cherry, topped with flowers. 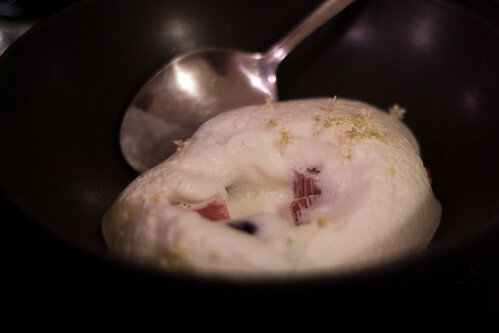 The texture of the marshmallow was fluffy, almost foamy, and it had just the right amount of sweetness to complement the rhubarb and cherries. A really interesting dessert, for sure. 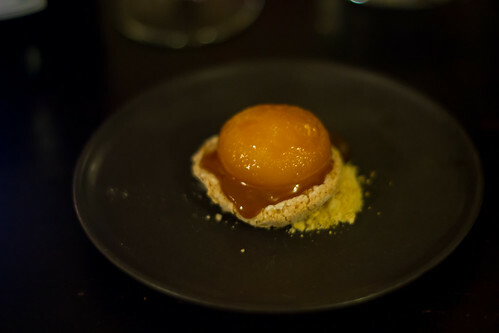 The final course was the chef's version of "Tocino del Cielo," with an egg yolk covered in a crisp layer of caramel sitting on top of a pie crust of sorts. Once the caramelized outer layer is broken, you find that the yolk is still running. I had been worried about how my body would take egg yolk (it typically doesn't like it so I generally avoid it), and there was a fleeting moment of thinking that perhaps I should play it safe and not indulge in this dessert, but in the end I did indulge and I am glad for it. This Tocino del Cielo was nothing short of amazing, with the perfect balance of sweetness from the caramel, saltiness from the egg, and crunchiness from the pie crust. It was most definitely worth getting sick over - which I didn't after all! 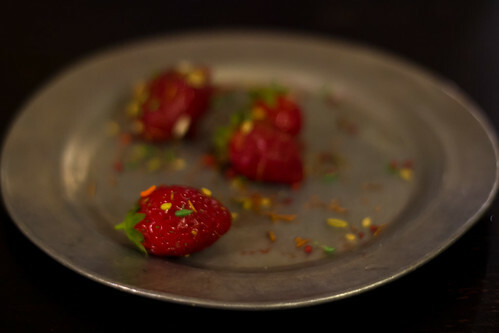 At the end of the meal, we were served fresh strawberries with fennel seeds, which I much prefer over the standard American practice of offering hard mint candies. In general, I have found the strawberries in Paris to be smaller but more full-flavored than what I'm used to in the U.S.
One of my greatest reliefs was seeing R. enjoy his meal as much as he did as he is more of a traditional meat-and-potatoes, Eat-n-Park salad bar kind of guy, so I really appreciated him being a good sport and trying foods that are not normally his "thing." He even commented on how much he appreciated the artistry and creativity involved in each dish, which I agree. We had spotted chef-owner Iñaki Aizpitarte in the dining room several times throughout the meal, and we finally got to meet him afterwards when we were already outside the restaurant and he happened to step out as well. Another diner had asked for an autograph on his menu, so R., with his quick thinking, suggested that I do the same, and went on to grab my camera to snap a photo of me with the chef. Not only did this not bother Chef Iñaki, he genuinely appreciated our compliments and spent a few minutes chatting with us. Our interactions with the humble, down-to-earth Chef Iñaki made me love his restaurant even more as it is just the kind of warm, welcoming place I like to support. I learned later that keeping his restaurant affordable is important to him, and that his reservation policy (as described above) was put in place deliberately to ensure that anybody (and not just food tourists) would have a chance at a table. It seems clear to me that rather than money, accolades, or fame, Chef Iñaki's passion is focused on the quality of his food and a goal to serve the common people. I find this endearing and highly commendable. 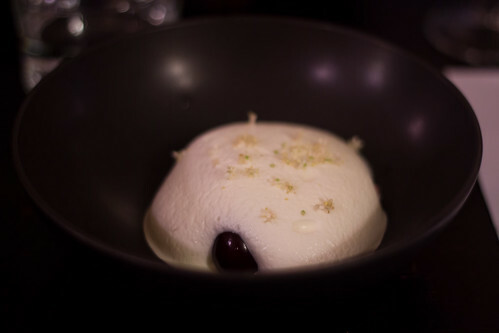 If I had just one word to sum up our visit to Le Chateaubriand, it would be "unforgettable." Thank you, Le Chateaubriand, for playing such a lovely part in our honeymoon! Our honeymoon food adventures are archived here.